Here at 10-S Tennis Supply, we know the thought of resurfacing your court can be daunting, and you might not know if it’s entirely necessary. Have no fear – we have developed a list of red-flags to help you make the right decision! As time goes on, the luster begins to fade on your once brand new tennis, basketball, Pickleball or shuffleboard court. So, how can you tell if the time has come to resurface your asphalt or concrete court? We are here to help! If any of the above sounds like your court’s current situation – or your courts look more like the “Before” image than the “After” image, it’s time to resurface! For those “Do It Yourselfers” out there who want to tackle the resurfacing project at your facility, 10-S Tennis Supply can provide you with the tools and materials to get the job done right. In fact, we have two primary products you should consider for repairing cracks and low areas – NovaCaulk and NovaBond. Information about these products can be found at 10-s.com, or by giving a call at 800-247-3907 to the friendly and capable staff at 10-S Tennis Supply! If you are located in south Florida and would like to hire a Certified Tennis Court Builder to complete your resurfacing project, consider contacting our sister company – Fast-Dry Courts, Inc. at 800-432-2994 or visit Fast-Dry.com for more information. If you are located outside south Florida and would like to hire a Certified Tennis Court Builder to complete your resurfacing project, feel free to give us a call at 800-247-3907. We may be able to recommend a company, or direct you to someone in your area through the American Sports Builders Association (ASBA). 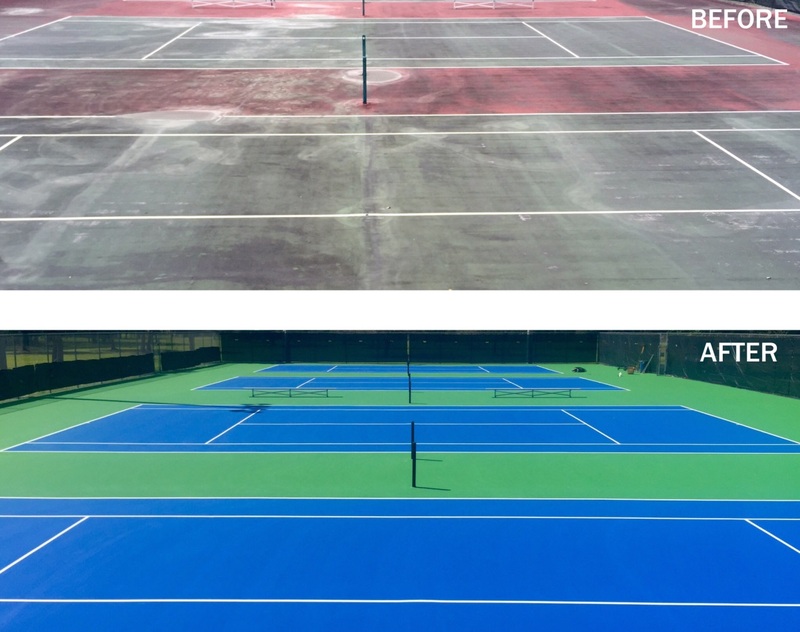 I had no idea that resurfacing a tennis court could make such a huge difference. I know that I get frustrated not being able to tell if the ball is in or out so it’s really important that the lines are repainted often. If your court reaches this point, it’s definitely time for some repairs. Thanks for sharing! Thanks for mentioning that water staying in your tennis court for a while after it rains is a sign that you need resurfacing. My kids all play tennis very avidly, and I want to make sure that our court stays in good condition so they can practice at peak performance. I noticed that there were some big puddles that remained after it stopped raining for most of the day. Since that’s a sign that you need resurfacing, maybe I should have a professional come and take a look and get that fixed. So happy that our post could help you out! If you are in the South Florida area, our company, Fast-Dry Courts, Inc. could help answer any questions, determine whether a resurfacing or repair work is necessary. Please feel free to call 800-432-2994 and browse Fast-Dry.com for more information or for an estimate on the work!